If you're a fan of fashion accessories, chances are that you could use a little help keeping your collection organized. Fortunately, there are plenty of great products available that can help you do just that! This great organizer is designed to hang over the door and provide a way to keep jewelry and handbags organized and out of the way. It is a two-in-one option that won't take up wall, shelf or drawer space, but you will need the back of a door free in order to use it. The jewelry section is great for holding earrings, pins and bracelets, although its design is not ideal for necklaces, which you'd be better off hanging. It is 17 inches tall by 11 inches wide. The pockets are all clear. There are 24 small jewelry pockets, six pockets for larger jewelry items - or even scarves - and six handbag pockets in varying sizes. This handy combination organizer is available from Wayfair for around $30. If you like the idea of a behind-the-closet-door organizer but you'd rather store your jewelry elsewhere, this option from Closet Mates will help you use that otherwise dead space to keep shoes and handbags organized and properly stored. It is the same size as the jewelry and purse organizer discussed above, but there are fewer - but larger pockets. Purse storage - It has four loop-style pockets designed to allow you to slide in purses of various sizes. Depending on purse size, you can store more than one bag per pocket. Shoe storage - It has six shoe pockets, each of which can hold a pair of ladies shoes. This useful storage solution costs around $30 and is available at Wayfair. Shaped like a little black dress, this fun organizer by Umbra (pictured) provides a fashionable way to organize and store your jewelry. It can hang on a hook or closet rod and offers storage on the front and back. To use this organizer, you'll need to have room to hang it in your closet or wall space where you can install a hook to hang it for display. It is is 42 inches long and 18 inches wide. There are 39 see-though vinyl pockets to hold pins and earrings. Twenty-four "hook & loop closures" are also included to hold necklaces, bracelets, and hoop earrings. This cute organizer holds a lot of jewelry and costs only around $20 from Amazon. If you'd rather store your jewelry in a drawer, this stacking jewelry tray system is a great option to consider. Available in a variety of individually-sold sizes designed to stack securely on top of each other, you can put together a custom combination of trays with individual compartments ideally suited to your jewelry collection. This option works only if you have a free drawer and doesn't allow you to hang any of your pieces, but it's a great way to keep items securely out of sight. Each tray is 1.5 inches tall. The largest tray is 16" X 9". The smaller sizes (9" X 4" and 8 X 9") are sized to fit perfectly on top. Styles with varying compartment styles are available. Prices range from around $8 to $18 per piece depending on size from The Container Store. If you prefer a compact jewelry organizer that allows you to store your jewelry just about anywhere - including packing it for travel - this envelope-style solution is a great option. It is made of a canvas-like polyester fabric and folds to a small size that you can easily slide it into a drawer that has other items in it, as well as toss it into a purse, backpack or carry-on luggage. Umbra sent me one of these organizers to review, and I love it. It is very well-made and the design is perfect for travel, as well as to keep those items you were very frequently separated out from other items at home. You won't be able to keep your entirely jewelry collection stored in this small bag, but it's ideal for on-the-go use. The folded size is approximately 7" X 9". It is less than half an inch thick. There are seven see-through zipper pouches of varying sizes. There is a non-transparent zipper pouch on the back outside. It costs $8 and can be ordered from Umbra.com. The back of your closet door or wall space behind the entry door to your bedroom or dressing room can be perfect places to store handbags. This pair of hanging purse racks (pictured), which can hang over a closet door our be mounted securely to a wall, is especially designed to hold handbags securely in place so you can easily view and access them. This storage solution is a great option to organize multiple handbags of varying sizes so long as you don't exceed each rack's eight pound weight capacity and have door or wall space available. The pair provides 16 hooks (eight hooks per rack). You can adjust the straps to meet the needs of your handbag collection. A set of two racks costs around $10 from Amazon. 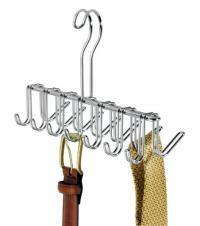 This hanging organizer is designed to function as a 'clothes hanger' for handbags. It hangs on a standard closet rack and has six large (1.25 inches deep) hooks, each of which is perfectly sized to hold larger handbag straps - or multiple handbags with smaller straps. This style isn't ideal if your closet is already crammed to overflowing, but it doesn't take up much room. It is particularly well suited for handbags that aren't very thick, but if you have enough space in your closet to accommodate wider pocketbook style purses, you could store them on this hanger. These hangers are available from Organize-It for around $7 each. If you're looking for an easy way to keep your scarf collection within easy reach of your wardrobe, this hanging scarf organizer is a terrific choice. Simply slide your scarves over the curved loops where they will drape to hang without needing to have creases folded into them. If your closet is too packed to add another thing, this option won't work for you - but if you have room in your closet, this is an ideal solution for situating scarves. 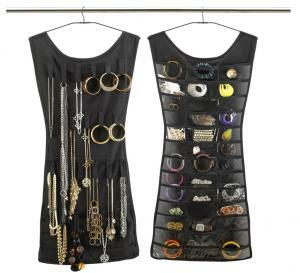 Designed to hang on a closet rack, this organizer can hold as many as 29 scarves. It is less than half an inch wide and just over 17.5 inches tall, though scarves will extend below the bottom when hanging. A set of two organizers costs around $20 from Wayfair. Also designed to hang on a closet rack, this scarf hanger is a great solution for storing scarves in easy reach of your wardrobe. It has 18 separate loops in varying sizes that you can use to hold scarves in an organized way that also doesn't require folding. At 11.5 inches wide by 9.75 inches tall, this hanger organizer is wider than the option suggested above, but it is also shorter, making it a better option for closets that have two levels of rods. Measuring just a quarter of an inch thick, it also is a bit narrower than the other style. The width difference is very small - but even a fraction of an inch in the closet can be precious! It costs around $9 from Storables.com. If you like the idea of keeping your belts and/or ties in your closet, this hanging rack (pictured) with hooks on both sizes is a great choice. The tie and accessory rack is designed to hang over a standard closet rack and hit has a total of 14 hooks (seven hooks per side) that are an ideal shape and size for holding ties or belts. The rack is 10.25 inches wide by 6.75 inches tall. Due to the hooks protruding from both sides, its depth is 3.75 inches. Because of the depth requirement, this isn't the best choice if your closet is already pretty full, but its an ideal choice for storing ties and belts within easy reach of the clothes you'll wear them with if space allows. This rack costs around $8 from Amazon. This wall-mounted peg rack is ideally suited for holding belts, ties or a combination of both, without taking up valuable closet space. 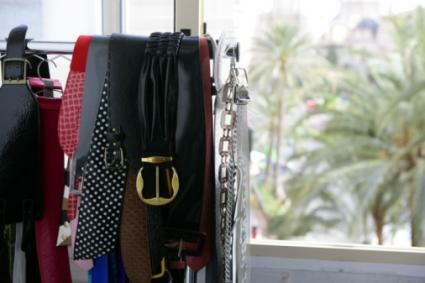 Simply use each hook to hold one tie or one belt. You'll be able to see 24 pieces at-a-glance rather than rummaging through a drawer to find the perfect item. The rack has to be mounted to a flat surface such as a wall, the back of a closet door, or a piece of furniture wide enough to accommodate the rack. Hardware is included, though if you are hanging the rack on a wall you may also need to use wall anchors to ensure that it is held securely in place. The rack is is 24 inches wide, 1.75 inches tall, and 2.25 inches deep. This rack is available from Storables.com for around $15. This great shoe storage solution by NovaSolo doesn't take up any closet space and serves double-duty as a piece of furniture. If you need shoe storage and your bedroom, dressing room, or mud room could benefit from a bench seating area, this wood veneer piece just might be perfect for you. Some assembly is required. You can place it against a wall, at the foot of your bed or next to a piece of furniture. The middle of the bench has two shelves, each of which can hold a few pairs of shoes. It also has space for two wicker baskets to store items. The seat is padded and the cover can be removed for washing. Priced just under $725 from Wayfair, this bench costs more than many other accessory storage solutions, but it is a good value for such a versatile piece. This stackable shoe organizer provides a great way to expand the shoe storage area on the floor of your closet, as you'll be able to store 12 pairs of shoes in the same amount of floor space that it would take to hold four pairs without a container. It is ideally suited for closets that have only one bar installed across the top rather than two levels of bars simply because there may not be enough room between the clothes hanging on a bottom bar and the top of the organizer. You can place additional shoes or other items on top of the organizer, or stack a second unit on top if there is room. This useful shoe storage option is available from The Container Store for around $40. Taking control of your accessories collection starts with making sure you have access to storage solutions that allow you to keep them both organized and accessible. Some of these handy items are sure to help you de-clutter the items you own while making the most of the space you have. Once you have your accessories under control, you might want to move on to organizing your closet as a whole.